I read this profile of the new President of Central African Republic with a little disquiet. I hope she does a good job and she sounds like a sound candidate. But she won’t do a good job just because she’s a woman; I hope she’s got the skills, nous and ability to steer a nation in crisis into calmer waters. She only has a year. I remember another woman who received similar plaudits and admiration; as time went on the reports of dissatisfaction at home began to clash with glowing plaudits abroad, often more for what she said and signified than what she actually did (or, rather didn’t do – like stay put long enough to actually run the country.) And right now Malawi’s Joyce Banda is up to her neck in the cashgate scandal . She may yet pull through, but like so many, my high hopes were dashed when she disappointed, more through neglect of her duties and due diligence than the usual grand plots. But there’s still more to come on that. We do female leaders no favours by not subjecting them to the scrutiny we would any man, or expecting gender-neutral attributes such as professionalism, dedication, skill and integrity. As an African, I don’t want a “Mother” of the nation any more than I want a “Father”. I want a public servant, who is keenly aware of the second half of that word. 1. Landlords will have to check the immigration status of tenants, facing large fines if they fall foul of the law. 3. Students will have to pay temporary levy towards the NHS. 4. The rules on appeals against immigration decisions have been drastically altered, to the detriment of the migrant. And this is before we look at the effects on the most vulnerable- refugees, migrant women fleeing domestic violence. While my MP was thankfully one of the 16 MPs with the courage of their convictions to vote against this bill, so many abdicated their responsibility. I knew this was coming but it’s so disheartening nonetheless. Too many reports are on process – the political winners (the rebels? Whatever – no one who matters anyway) and losers (Cameron and May – and I’d add decency and justice), but this Bill will have implications for us all. The takeaway from this? Be mindful of who you love (and hope you earn enough to stay together in Britain if your beloved is from outside the EU. )Be mindful not to get tangled up in the system if you can help it – you may have no space to appeal. Try not to sound too foreign, look too foreign (apologies to all who look a little too dusky) or have a complicated name or weird accent – especially when renting housing, going to the bank or the hospital. Oh, and just in general now – try not to be poor. THREE. Painkillers. I try to avoid them but sometimes when you’re in a lot of pain, they can temporarily release you from the emotional drain of chronic pain. FOUR. Onomollywood, a restaging of classic film stills with black models – I wish I could go and see it after this Guardian article. There is a flurry of activity around the issue of diversity in the media and creative industries in Britain. I wonder if it isn’t influenced a bit by Steve McQueen’s success with 12 Years A Slave in the USA, where it secured numerous awards nominations. For a few months now there have been articles about Black British actors achieving success across the pond, and coming back to a higher profile and better jobs here: Idris Elba, David Harewood, Marianne Jean-Baptiste, to name a few. I am not sure how long it will be up, but Radio 4 hosted a spiky discussion on diversity in the creative industries with actor Gary Beadle and Simon Albury, former chairman of the Royal Television Society, in which Simon pointedly took the BBC to task for its own record on diversity. Also worth checking out: The Runnymede Trust’s new Race Card site has some great posts, videos and debates on diversity in general. Day by day, it seems, there’s a drip feed of sad and salacious details of the breakdown of the relationship between French President Hollande and his partner Valerie Trierweiler. The motorcycle helmet, the trysts with actor Julie Gayet, Trierweiler’s hospitalisation, an alleged tantrum in which she broke some historical relics at the Elysee Palace, Hollande’s apparently brusque winding-up of his relationship with Trierweiler, the view of some that chickens are coming home to roost for the woman for whom Hollande left his former partner and mother of his children, Segolene Royal. My view is that at the end of the day, it’s sad to watch a relationship dissolve so publicly. But it’s the issues around the post of First Lady that I find perplexing, given the reports that Trierweiler wants to hang on to her role and office of First Lady, as well as her charity work. She doesn’t need to be First Lady to do charity work, but undoubtedly her profile as First Lady must have helped her have influence in some issues, because of her proximity to the President. And there’s the rub. There’s something ridiculous about a woman’s role that depends on her proximity to power, specifically because she in a relationship with that person. First Ladies can do a lot of good, but it’s crazy that Michelle Obama and others have to give up their careers to assume this politically “safe”, neutered role. It’s even crazier to want to keep it (if the reports are to believed) after the relationship is broken, as if it’s a normal job. 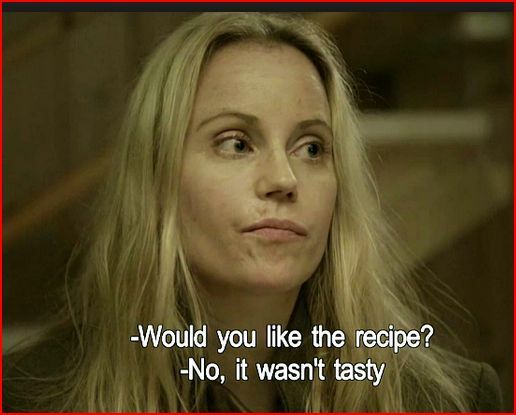 I’m currently enjoying Saga Noren in Season II of The Bridge. She’s smart, tough and blunt, oblivious to social cues – there are more than a few hints that she might be on the autistic spectrum. Sometimes, it’s hilarious. In one of my favourite scenes this season, her work partner Martin thanks her for helping to save his son from danger, and he gives her a massive hug. She pats him awkwardly on the arm and asks him: “Are we done yet?” She also honest, direct and drives a great sports car. LaDonna in Treme. She’s fierce, true to herself and incredibly brave. The scenes involving her sexual assault and how she coped afterwards are incredibly moving. She’s nobody’s fool, but also quite loving and sentimental. Kalinda Sharma in The Good Wife. The definition of badass. She’s not just a top-notch investigator, she’s loyal, loving and fiercely protective over those she cares about. 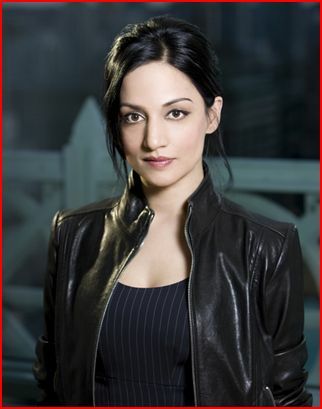 She’s also…Kalinda. There is no other female character on TV with such agency and complexity, emotionally and sexually. She defies stereotypes of both gender and race. Archie Panjabi fully deserves her Emmy and should be celebrated more here at home in Britain. 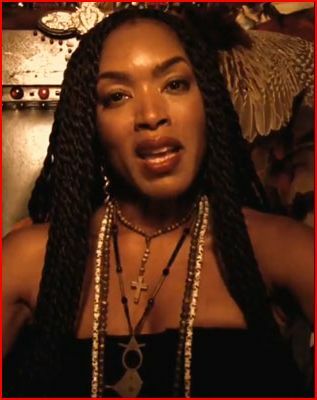 Ok, so American Horror Story is not a show I particularly enjoy (mainly because it is ridiculous) but Angela Bassett chews up every scene she is in. Marie Laveau is a bit of a prickly pear – but she’s a survivor. Bassett gives her an intensity that elevates the character from simply being a foil to Fiona, played by Jessica Lange. She’s cunning, passionate and unapologetic. 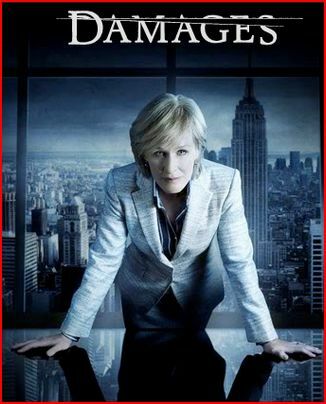 Patty Hewes in Damages. Yes, it’s off TV now, but it’s one of the best shows I’ve ever seen. It’s sharp, keeps you guessing and Glenn Close is the brilliant, morally ambiguous, often cunning, sometimes vulnerable, Patty Hewes, a top lawyer who is vastly successful in her professional life but pretty dysfunctional in her personal relationships. It’s also wonderful to see an older woman headlining such a brilliant show. CJ Cregg, White House spokesman and all-round clever lady in the West Wing. Again, off TV but CJ is one of the best characters Aaron Sorkin ever wrote. Let’s just forget the Newsroom ever happened. My first thought when watching Nick Robinson’s much-vaunted programme, The Truth About Immigration, at the start of the month was: “Well, it could have been worse” – which is more of a reflection of the tenor of the immigration debate at the moment than the programme. Robinson touched on two arguments that I’ve seen more since, and which are interconnected. 2. Because, finally, the immigrations debate is decoupled from race, especially as we are now speaking in the context of a debate about European migration from Eastern Europe. Collier has also made this argument. My questions is, when was this silence? The debate has been raging since before the first immigration controls were enacted, and many of the same arguments we see today about the changing nature of the country have been made for decades against one group or another. However, immigration under the Labour government did coincide with greater anxiety about globalisation, a change that I don’t think was really explained to people – nor were their concerns really listened to. In the rush to “listen” to people over immigration now, it’s interesting to note that this is the only issue on which the political class is willing to really interact with the public. Food banks? Monster the Trussell Trust. Bedroom tax? Deny, deny, deny. The government is willing to fudge statistics, suppress reports (like the politically inconvenient one that found immigration a net benefit to the country) and just ignore the pressures put on the NHS, housing and other areas – but on immigration? They scramble to look responsive to people’s perceptions, even if they are misinformed. But, onto the second part of this argument – that race and immigration are now decoupled from one another, and in this post-racial environment we can now have this debate at last. Not true. The fact that racial abuse in schools is up 69% as a result of this rhetoric shows that there is a racial element to this debate. The “Go Home” van electrified people precisely because that language is not a harmless suggestion, but a phrase that the far right has used against migrants (and settled citizens who are ethnic minorities) in this country for decades. To debate immigration is not racist. But if you co-opt the language of racists and use it to pander to racism in the general public (real or perceived) then yes, that is racist. Today I bit the bullet and tackled the garden, uprooting weeds (well, most of the plants actually; at this point I can’t tell what’s what) and getting rid of empty snail shells and (cat? fox?) poo. It was gross at times, it was hard work, but it was also therapeutic. Underneath all the mess, I can see snow drops and hydrangeas peeking through – they’ll be ready in a few months. As I get more busy, my gardening has become more infrequent, which is a shame because gardens have life all year round . Even in the dead of winter there are always little signs that spring will come eventually. It’s comforting. It’s hopeful. It’s a timely reminder that no matter what happens, life goes on. I was dreading looking at my roses, which have been swimming in their pots thanks to the torrential downpours we’ve experienced this winter. But as I drained the water from the pots and pruned off the dead branches, I saw delicate little buds tucked away beneath the leaves, waiting for Spring. I would add that this goes beyond immigration. When it comes to the (ideological, let’s face it) cuts being visited on the poor, the disabled and the more vulnerable in society, the lack of investment in housing, the fact that so many are underemployed, the scapegoating of immigrants, the poor, people on benefits and the trashing of those who try to speak up for them, like the Trussell Trust, concerned with the growing numbers of people using foodbanks in this country, then the question is even more salient. Why is it only on immigration that politicians scramble to “get it”? What kind of country do we want to be? And who belongs in it?